알부민은 간경변에서 아주 널리 사용되는 약제입니다. 이탈리아 간학회에서 알부민 사용에 대한 position paper를 발표한 적이 있는데, 아주 정리가 잘 되어 있어 추천드립니다 (AISF-SIMTI position paper: the appropriate use of albumin in patients with liver cirrhosis Blood Transfusion 2016). 이곳에서 나오는 중요 요약입니다. 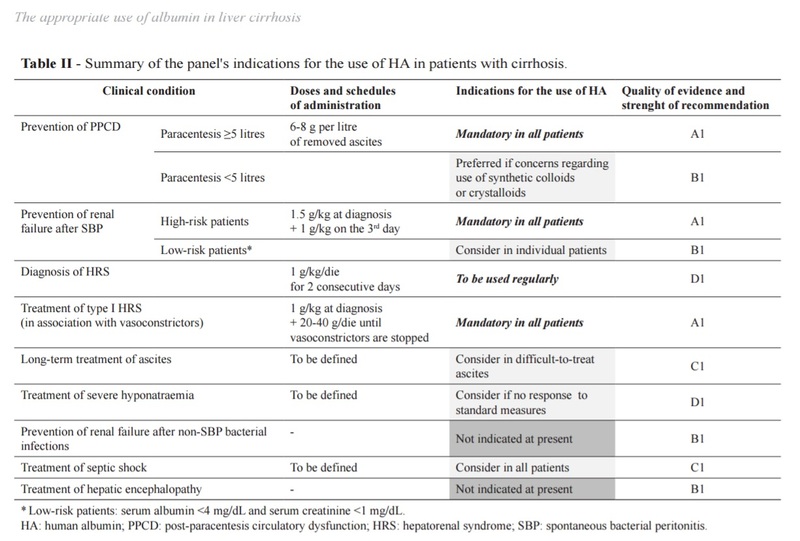 International guidelines currently endorse the use of human albumin (HA) to manage clinical complications of cirrhosis characterised by extreme effective hypovolaemia: (i) prevention of post-paracentesis circularatory dysfunction; (ii) prevention of renal failure induced by SBP; and (iii) diagnosis and treatment of HRS, in association with vasoconstrictor drugs. A consequent assumption is that the presence of hypoalbuminaemia should not be a pre-requisite for the administration of exogenous HA in these conditions. To be defined로 되어 있는 내용 중 하나가 "long-term treatment of ascites"분야입니다. 관련 내용입니다. The use of HA for the treatment of ascites is allowed within the Italian National Health Service, but reimbursement for out-of-hospital prescriptions is limited to patients with ascites not responding to standard diuretic therapy (Note 15 of the Italian Medicines Agency). However, the long-term administration of HA to treat ascites is still debated, because of the lack of definitive scientific evidence supporting its clinical benefit. Apart from a few reports of uncontrolled small studies and sporadic cases from more than a half century ago, only two randomised clinical trials from an Italian group have been published so far. In 1999, two groups of hospitalized patients with cirrhosis and ascites were randomised to receive diuretics, given in a stepwise response-guided schedule, with or without daily infusion of 12.5 g HA during hospitalisation (median duration >20 days) followed by 25 g/week after discharge (median follow-up >20 months)68. The treatment with diuretics plus HA was overall more effective than diuretics alone in resolving ascites during hospitalisation and reducing the time the patients stayed in hospital. However, these results were achieved only in the subset of patients receiving low-dose diuretics (25 mg/day furosemide and 200 mg/day potassium canrenoate), while the advantage was lost when the anti-aldosteronic drug was used alone or when higher doses of diuretics were needed. No effect on survival after discharge was seen. Despite the positive results, it is hard to transfer these regimens into current clinical practice in which these patients are managed as outpatients. In a subsequent study, a cohort of 100 patients was randomised to receive chronic treatment with either diuretics alone or diuretics plus HA (25 g/week for the first year, then 25 g every 2 weeks) (median follow >84 months). The recurrence rate of moderate to severe ascites and mortality were significantly lower in patients who received the supplemental HA. However, the relatively small sample size prevents firm conclusions from being reached. No other controlled clinical trials have been performed so far to evaluate the effectiveness of prolonged HA administration in the treatment of cirrhosis and ascites. The lack of confirmatory randomised studies, together with the high cost of this therapeutic strategy, explain why long-term chronic HA infusion is not endorsed by international guidelines and it is, therefore, not usually included among therapeutic options for difficult-to-treat ascites in countries other than Italy. A definite solution to this controversial issue will be provided by an open-label, multicentre, randomised, no-profit clinical trial, currently underway in Italy. This trial, supported by the Italian Medicines Agency, is comparing the effectiveness of long-term weekly administration of HA (40 g twice a week for the first 2 weeks and 40 g once a week for a maximum of 18 months independently of the serum albumin level) in 420 patients with cirrhosis and uncomplicated ascites receiving at least 200 mg per day of an anti-aldosteronic drug and 25 furosemide per day (ANSWER study, NCT 01288794, www.clinicaltrials.gov). The preliminary results from 386 patients were recently presented in abstract form70, showing that patients treated with diuretics plus HA required significantly fewer paracenteses and had lower incidences of refractory ascites as well as SBP, renal impairment, and hepatic encephalopathy. Thus, although increasing evidence supports the benefit of HA in improving the management of ascites and the clinical outcome of patients with decompensated cirrhosis, the final results of the ANSWER study are eagerly awaited to confirm the efficacy of long-term administration of HA for this indication. AISF-SIMTI recommendations on the long-term use of albumin to treat ascites - Long-term HA can be effective in the treatment of ascites in association with diuretics (C1). The efficacy, dosage and timing of HA administration need to be defined by adequately-powered randomised controlled trials. The researchers found that patients receiving human albumin had a higher survival rate. At 18 months, 78% of people who received albumin were still alive, compared with 66% of those treated with standard-of-care therapy alone, for a 38% reduction in mortality. 복수로 이뇨제를 복용중인 환자분들에서 human albumin IV를 어떻게 하는 것이 좋을지 고민하게 하는 결과입니다. Full paper가 나오면 잘 살펴봐야 할 것 같습니다.